The Young and the Restless (Y&R) spoilers for the week of August 28 through September 1 tease that several connections will prove dangerous. For starters, Lily (Christel Khalil) and Jordan’s (Darnell Kirkwood) bond will create family drama. After Jordan brings Lily a bouquet of flowers, they’ll share another close moment. Unfortunately, Mattie (Lexie Stevenson) will notice their spark. Y&R spoilers say Mattie will rip into Lily for moving on so quickly. Cane (Daniel Goddard) hasn’t even been out of the house that long. Lily will have a hard time explaining the situation to the teen. She’ll assure Mattie that nothing serious is happening with Jordan. However, deep down Lily knows there’s something between them. Lily will do her best to placate Mattie and see where life takes her next. Meanwhile, Nikki (Melody Thomas Scott) will try to halt the feud between Nick (Joshua Morrow) and Victor (Eric Braeden). She’ll feel like this nasty conflict has gone on long enough. Alas, Nikki’s efforts will fall flat. Victor and Nick are just too stubborn to call a truce right now. 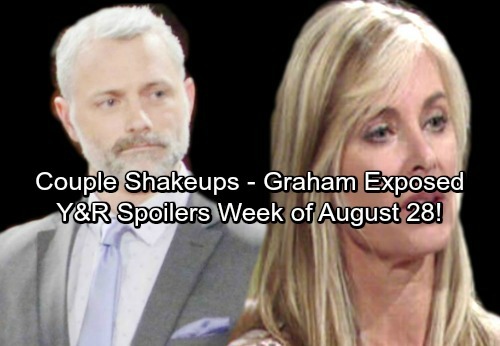 Elsewhere, Ashley (Eileen Davidson) will manage to dig up some dirt on Graham (Max Shippee). As more info emerges, Ashley will get a clearer picture of what Graham’s all about. Other Young and the Restless spoilers say Victoria (Amelia Heinle) will make a shocking discovery. She’ll find out that Phyllis (Gina Tognoni) nudged Ben Hochman (Ben Hermes) in her direction. Victoria will lash out at Phyllis for putting this mess in motion. A huge confrontation is coming up. Later, Victoria will spend some time reconnecting with Billy (Jason Thompson). They’ll take a trip down memory lane and the result will be a steamy kiss. There should be trouble in “Philly” paradise soon. Across town, Noah (Robert Adamson) and Tessa (Cait Fairbanks) will also face some issues. Tessa will begin to feel distant from Noah thanks to the secrets she’s keeping. Problems could be looming for Devon (Bryton James) and Mariah (Camryn Grimes), too. Now that Jordan is out of the picture, Hilary will turn her attention back to her ex-husband. She’ll interfere in Mariah and Devon’s relationship, so that should get a strong reaction. It looks like a great week is in store for Y&R fans. We’ll give you updates as other Young and the Restless news comes in. Stay tuned to the CBS soap and don’t forget to check CDL often for the latest Young and the Restless spoilers, updates and news. The Young and the Restless Spoilers: Phyllis Forms Strong Connection With Scott – Friendship Turns to Love? The Young and the Restless Spoilers: Could A Genoa City Disaster Spark Love Between Scott and Mariah?